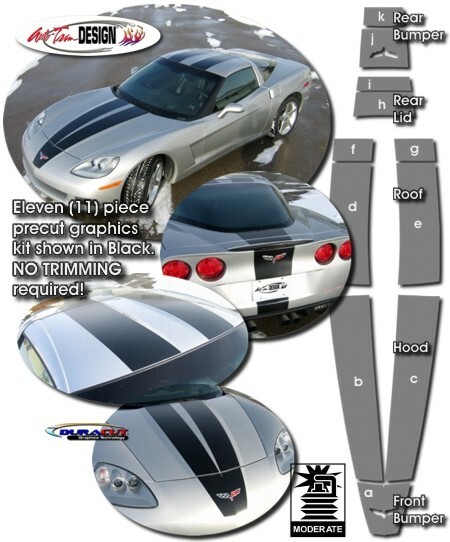 Make your '05-'13 Chevrolet Corvette C6 "Tough-looking" with this awesome Rally Stripe Graphics kit. Stripe package is not just a set of 10" strips in a box. Our graphic kit consists of prefitted and contoured pieces as shown in the illustration and specifically fits the C6 body style Corvette. Select from our eleven (11) piece Coupe or nine (9) piece Convertible kit. Stripe width is approximately 10" (25.40cm) and set for a center spacing as noted in our online application and care instructions. Trimmable Spoiler Kit #ATD-CHVCRVTGRPH84 consists of one (1) piece 16" (40.64cm) length that can be trimmed during installation for custom spoiler applications. This kit is NOT available for Grand Sport, Z06 or ZR1 Corvette models.